As much as we may wish things were different, we only have 24 hours each day, of which many are already accounted for. And most of us have way more to do than the time seems to allow. When it comes to better time management, establishing productive routines is a fantastic technique. Routines let us replicate a positive pattern over and over, so that it becomes almost automatic. And when we’re managing our time well every single day, the cumulative results can be incredible. Here are 6 ways to make over your work routine to make your minutes go further. #1. Set your top 1-3 priorities for each day. If you’re anything like me, you have a lengthy to do list bursting with everything from big picture ideas to nice-to-haves to more urgent to-dos. Looking at it, it’s hard to tell where to focus first, and what to tackle in which order. Often this leads to just choosing whatever seems most painless, and working on that task. But is that the most important task for you to accomplish that day? Likely not. Instead, I would recommend choosing only 1-3 key priorities for the day. If one of your priorities is a big, hefty task that will take you hours, maybe you stick with just that one. The key is to be focused, specific, and allow yourself to de-prioritize all other to dos. This approach helps you manage your time with greater effectiveness since every minute is spent focusing on one of the most important things. If you’re looking for more inspiration about how to prioritize, check out my post Project Prioritization: The 5 Questions to Ask Every Time You Need to Focus. I’ve also created a project prioritization worksheet which you can find in my free resource library! Sign up below. #2. Start with the big stuff. Looking at your top 1-3 priorities, which one is the hardest, biggest, and most challenging? Start with that one first. You’ll be sharpest, and more focused. But most importantly, you’ll be more likely to get it done as you won’t be able to move on to other tasks until it’s complete. If the task is too big or overwhelming, break it up into chunks. Say, for example, you’re working through a challenging course. Maybe you tackle one chapter per day, but do that task first to get it done and out of the way. The key here is to better your chances of tackling all your priorities by getting the biggest one out of the way first, and then tackling the others as time allows. Between sitting down at your computer to finding files and then ultimately getting into a good groove, there’s what I think of as “buffer” time. Meaning, that if you sit down at 9am to start on a task, you likely won’t be in peak working mode until say, 9:05, 9:15, or later. To make the most of your time, try to block chunks of time in your calendar to work on various tasks. Ideally, you should be blocking enough time to complete each task, or at least the most time you can carve out in a block. You can certainly take breaks during that time (more on that later!) but give yourself the ability to get a decent amount done in each sitting. Because in most cases, 1 hour of work is a more effective use of time than 4 15-minute chunks. If you’re looking for inspiration, my post The Best Way to Use an Electronic Planner goes into detail about how I block my time. Along the same lines as blocking your time, working in batches can make your minutes go further. Do you, for example, have to create 20 social media posts over the next week? Instead of doing them in 20 different sittings, maybe you can do them all at once. You’ll have your key files and tools open, and can likely churn out a greater amount of output than by splitting them up. I use this technique for my blog every week. I have dedicated writing time where I sit down and write 1-2 blog posts or email newsletters while I’m in the writing zone, and other time blocks where I work on graphics and social media for blog posts. This is far more effective. To make the most of your work time, keep it as free of distractions as possible. All it takes is an email, phone call, or text to derail you or take your focus away from the task at hand. And in almost all cases, these distractions are non-urgent matters that could wait a few hours. Close your email window/tab on your computer. Close or minimize all applications, windows, and tabs that you don’t need for the task at hand. Work in a separate room, meeting room, or office for a few hours to prevent drop bys. According to the Pomodoro Technique, working in 25-minute increments followed by short breaks can work wonders. Set a timer for 25 minutes. You can either set a timer on your phone, on a physical timer, or through a browser extension. I use Marinara: Pomodoro Assistant for Chrome. It’s free. When you hear the timer ring, take a 5-minute break. I’d recommend getting up and either stretching, going for a little walk (even around your office!) or completing a task away from the computer or a screen (like folding laundry). After four 25-minute work intervals, take a longer break of 15-30 minutes long. 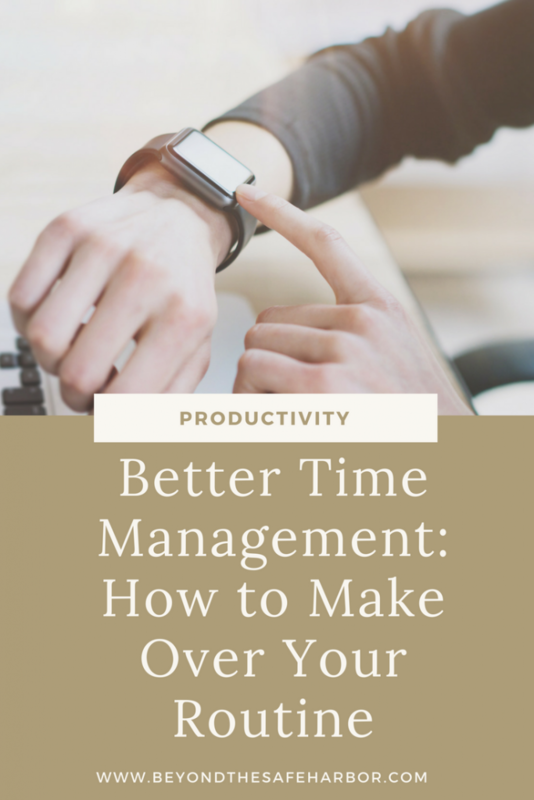 Learn more about this technique in my post How to Use the Pomodoro Time Management Method. Do any of these tips resonate with you? Which ones do you plan on trying? I’d love to hear! Also, leave us a comment with how you manage your time!